Sean Tyrell is a well known figure in contemporary folk music circles. 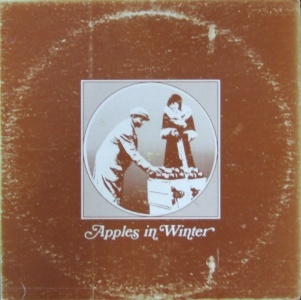 He recorded this highly appealing folk album with Apples In Winter while living in the USA in the mid-70s. Sean Tyrell (born Galway 1943) learned to play banjo and performed in the clubs and pubs in Ireland in the 60s before emigrating to the USA in 1968 where he became part of a duo (with Jack Geary?) and toured the clubs and Irish music sessions for 5-6 years, from Greenwich Village to San Francisco. He tried to put together a bigger group but it failed to gel. 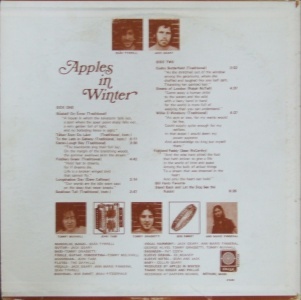 Before returning to Ireland he recorded an album and single with Jack Geary as Apples In Winter for an small local label in 1975. Copies are not easy to find but it's well worth tracking down. It's a mixture of traditional tunes and ballads, most of them well known. It has been incorrectly described as folk psych, rather like the Callinan-Flynn LP. While it is certainly not psychedelic, it has an extremely appealing, gentle charm, especially on side one. Side two is less successful but overall this album is recommended. Recorded at Eastern Sounds, Metheun, Mass.